For a long time I knew that the path I was walking was a different one even though I didn’t understand or know why, but just knew that I had to follow it. Tried unsuccessfully to fit so many moulds that were presented to me but couldn’t. Time has proven to me that we all have our unique way of being and that try as we might we cannot escape from the true nature of ourselves. The Initiates Way began initially in 2006 when I created a set of images to help me understand the Tarot on a personal level and discover what it meant to me. Dipping the toe into the sea of Magical images not knowing where it was going to carry me. I was at the beginning of a very long journey and I had no idea where I would end up. Using the Tarot as a tool for Spiritual Development since then has been priceless in terms of helping me find my place in the world. Without it I would never have begun the exploration of the inner worlds and initiated experiences in my life that have given me a foundation upon which to live and breath. Part of the journey has been to fully embrace the Goddess in all of her glory and celebrate the divine feminine and masculine equally within my spiritual practices. Creation of the Soulscapes Tarot was the first part of that journey. Using the ideas and concepts of each of the Major Arcana of the Tarot to produce my own spiritual enlightenment journey in pictures, while living it in the physical world. 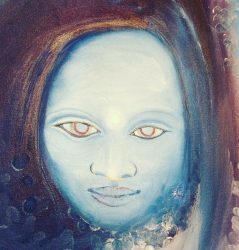 The Initiates Way is the path that I have chosen to walk and last year in January I started to paint another set of images at the outset of another rite of passage beginning with The High Priestess who came to me in a dreamlike vision and told me that I would ‘serve’ at her High Altar. During the creation of the images for the Initiates Way I wrote, participated in and led workshops road testing 22 Meditations that were created with the intent of taking the practitioner of Tarot into uncharted spaces so that they could experience these worlds for themselves. As we enter into February 2018 the Initiates Way has taken on a life of its own and the remaining images have been coming to fruition when they are ready to be birthed. The completion of the set of images and producing the second deck will be the pinnacle of this awesome journey. The foundations are laid now for anyone who would like to test the water and see if they are ready to facilitate their own seeking for enlightenment and wisdom. The Guided meditations will be available on Youtube and on the Blogpage. Previous PostPrevious New Year. Doors opening and doors closing.